In order to have a thriving business, one needs to be able to quickly analyze available data and use it to make the right business decisions. If you collect your business data in an SQL database, the best way to analyze it is using SQL server pivot tables. A pivot table is a general way of gathering and displaying business data for reporting, data visualization, and subsequent business analysis. The main advantage of pivot table is that it is greatly increase data visibility and understanding that is why it is commonly accepted by BI specialists worldwide. They display data in tabular form and are widely used in OLAP data analysis and reporting. Creating a table right in the SQL server using T SQL. However, this method will only suit you if you are an SQL programmer or have one in your company. Another way of how to use pivot table in SQL is using ready controls that connect to your database and generate pivot tables using your data. When SQL Server 2005 was released, it introduced new PIVOT and UNPIVOT commands as enhancements to T SQL. These commands help you create and use pivot tables. PIVOT command transforms tabular data into table value data, and UNPIVOT does the opposite. The main advantage of using PIVOT and UNPIVOT commands and creating tables directly in the SQL server is no need for external tools. At the same time, it is also the main disadvantage as it has limited data visualization functionality as compared to those tools. Besides, working directly with SQL server requires coding skills and experience with T SQL, so it is not really suitable for business users. When one uses pivot tables, it is usual to define pivot column headers, so the table has unchanged structure. However, if you don’t want to rigidly define it in your script, or if you need the data to constantly update, you can use a dynamic range, thus creating a dynamic pivot table in SQL server. The advantage of using a dynamic table is that it is automatically updated when the data is added, removed or changed. As a result, it will always contain up-to-date data. It is possible to create dynamic pivot tables in SQL server directly, as well as using special tools. Another way of generating pivot tables for your SQL server data, including dynamic ones, is using special tools that summarize, analyze, and visualize the data you need. The most popular instruments for creating SQL pivot tables are Microsoft Excel or MS Access. However, there are a lot of specialized pivot table tools that offer significantly more functionality for data analysis. One of such tools is Ranet OLAP, which is designed to work specifically with MS SQL server OLAP data. The tool collects the data from the server, and allows business users to build pivot tables and analytical reports by dragging and dropping elements. The data can be further visualized on diagrams and pivot charts, which makes the data easier to analyse. Ranet OLAP pivot tables support custom cell styles, as well as complicated types of analysis, such as what-if analysis etc. You don’t need to have any programming skills or experience with SQL to work with pivot tables as they are created by simply dragging and dropping elements. Pivot table tools usually support custom cell styles, diagrams, pivot charts, heat maps and other options to visualize the data. These components will help you to create unique report and highlight the most important parts. So you can analyze the data from different sides according to your requirements. Summarizing the data definitely helps to have faster results and decisions. We all know - time is money. So, pivot table reporting tools help us to get this money faster. All their components are aimed to optimize work with huge data amounts, saving our time and resources. 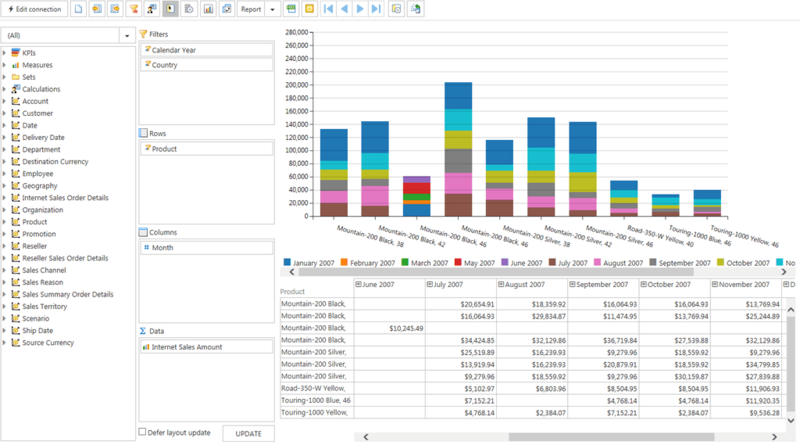 Pivot table in SQL is a relevant tool for business analysis nowadays. The only thing left is to choose the right vendor for it. Ranet OLAP suggests to try our pivot table in practice. GalaktikaSoft provides you with opportunity to download Ranet OLAP 30-day trial for free or use demo version. Try first and make sure of all its benefits yourself.